You all remember my love for Diana Peterfreund's Secret Society Girl novels, yes? A certain patriarch of a certain . . . well. You remember. The thing is, those are my kind of New Adult novels. And I think I've been sort of quietly looking for more in that vein ever since. And then a couple of months ago I ran across Diana enthusiastically recommending a new series for fans of the SSG books. It's called the Ivy Years series and it is written by Sarina Bowen. Needless to say, I investigated further. When I found out the books were also sports-related, I said to the internet, Say no more, internet. You have my attention. 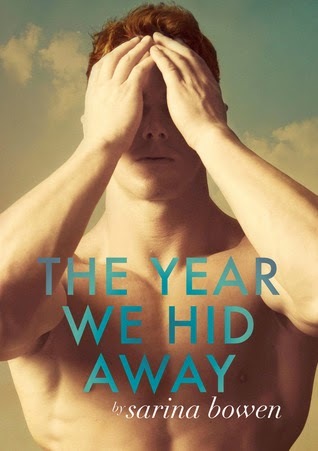 And that night I jumped in and started the first book—The Year We Fell Down (which, by the way, such a great title)—and I thoroughly enjoyed Bowen's easy style, down to Earth characters (well, most of time, I'm looking at you Hartley), and the fabulous college setting. So when the second book came out, I was all set to dive right back into life at Harkness, particularly when I heard it featured Bridger—a character from the first book who I really liked but who I had more than few concerns about. Bridger McCaulley's life does not resemble what it used to be. Not that it's ever been easy, but there was a period there where he worried . . . less . . . and partied more. And he played hockey like nobody's business. Those days are gone now that he's wholly responsible for his little sister. And it doesn't help matters that it's all on the down low since child protective services would have a heyday if they knew a college hockey star was hiding a little girl away in his dorm room. Scarlet Crowley's life also altered suddenly and irrevocably and for the worse. She's come to Harkness to escape as many of her problems as possible, starting by enrolling under a different name in order to stave off as much of the media as possible. When the truth about her father's charity was made public, the life she led became impossible and she hopes distance from her parents and her father's crimes will allow her to build her own life. When the two meet, sparks fly, but they agree not to take things any further than study dates in the cafeteria. Bridger has no time to speak of and a pack of responsibilities weighing him down to the ground. Scarlet fears discovery and the look on Bridger's face were he ever to find out the kind of family she comes from. But it proves to be difficult for each of them to give up that regular human contact again. With someone who might just understand. "You never say very much about Miami Beach," Bridger said as we lingered over our coffee. "Or your family." I didn't bother to hide my flinch. "Miami Beach is the best. My family . . . not so much. I don't really talk about them. It isn't a nice story." The truth was, I didn't want to lie any more than necessary to those deep green eyes. Bridger's face flashed with sympathy. "Okay. It's exactly the same for me, but I didn't expect that. Because you look like someone from a family with a nice story." "And you don't?" I countered. He put one hand on his own cheek and covered mine with his other. "You make a good point. Maybe there's no look. I should probably stop thinking that everyone else in this room has it easier than me." I turned my head, and together we both scanned the laughing, eating, bustle that was the student center at noon. It sure looked happy out there. For just a moment, I was a goalie again, analyzing the play, scouting for trouble. "Nah," I said finally, turning back to Bridger. "I still think most of them have it pretty good." Bridger grinned. "This is the cynical table," he said, tapping his fingertip on the wood grain. "Party of two," I agreed. Their Tuesday and Thursday lunch/study dates never failed to bring a smile to my face. And the natural and seemingly inevitable way they grew into a relationship with a healthy amount of depth kept the smile upon my face. They are able to take a breather of sorts and step away from being self-conscious when they're together. It feels like a reprieve, doled out in careful doses. No wonder they look to increase those doses. I also appreciated the way Bowen handles the "finding out" of the respective pasts. It was a recipe for maturity while still paying tribute to their actual ages and the extent of their life experiences. As is the case with the best romances, I am so very glad they found each other. As for myself, I am so very happy to have found a fresh voice in the new adult genre. Recommended for fans of Down London Road and, of course, Secret Society Girl. Dear Author - "Definitely one of a few New Adult books that I’ve read recently that truly resonates." Have Book Will Read - "I admire Sarina Bowen for once again not being scared to tackle difficult topics and for pushing her characters beyond the normal NA dramas." Hopeless Book Lovers - "Their relationship sky-rocketed so high in my heart." Into the Hall of Books - "I have clappy-hands about these books." Kaetrin's Musings - "It felt grown up and smart." Smexy Books - "The conflict kept me completely riveted." Lovely review, Angie! You didn't even have to review this series for me to pick it up, it only took one tweet from you. :P Hartley's issues kept me from loving the first book but I really liked it. Looking forward to reading this second one since you mentioned that it's even better. Oh and I still haven't read the Secret Society Girl books. I know, I know. I really should get to them. I love reading your reviews - glad you're finding time to write them! I can't remember if you've read Tammara Webber's Between the Lines books - they're more straight-out romance, but they have the same NA feel IMO. Aw, thanks, Li! It's been a stupidly long dry spell, I know. I've been reading all along, but It feels so nice to be writing again. You know, I think I read GOOD FOR YOU quite awhile back and enjoyed it. I need to go back and try the others. You should try them (of course I'm gonna say that). The first one is sort of an intro and I spent most of it like, what am I even reading about secret societies?! But that's all it takes. The next three are SO good. And they house literally one of my top literary crushes. Sigh. I know. The time . . .